For BlackBerry's mobile hardware business, the struggle is real. Though the Android-powered Priv generated a fair amount of pre-release hype, sales have been lower than anticipated. Despite the shortcomings of the Priv -- seen by many as the Canadian company's last real hope of competing in the hardware market -- there have been hints of two new mid-rangers for release at some point this year. CEO John Chen has now confirmed that a couple of new Android devices will be forthcoming, and both will be considerably cheaper than the Priv. Analysts have already begun to write obituaries for BlackBerry's mobile hardware department, which is now dragging down the firm's conversely profitable software division. In an interview with The National in the UAE, Chen admits that his company may have priced itself out of contention with the Priv, and he probably has a point. Despite the anticipation for a BlackBerry running fully-fledged Android, $700 was just too much for a handset that didn't review particularly well. Even with the recent $50 price cut, there are many, many better devices out there, most of which don't cost nearly as much. The two new devices will both run on Android; one will have a keyboard whilst the other will be a touchscreen-only effort. According to Chen, the handsets will be priced at around $300-$400. As his company re-evaluates its strategies, it's fair to say that we may not see another smartphone from BlackBerry after these two mid-range devices have been rolled out. It's somewhat hard to believe that only a decade ago, BlackBerry handsets were as ubiquitous as iPhones are today. But the arrival of Apple's handset in 2007 -- coupled with BlackBerry's failure to adapt to the major changes within the mobile market -- have greatly contributed to its current plight. Had a device like the Priv been available five years ago, BlackBerry may be in a more favorable position than it finds itself in. 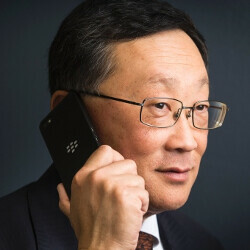 Chen said back in a November interview with FOX Business News that the market response to the Priv would indicate whether BlackBerry should continue making mobile hardware. The answer appears to be a very resounding 'no'. It was the price that doomed the priv, hardware wasn't at all up to snuff for a 700 handset. Even at 650 it's overpriced. Great software on the priv but hardware was not good compared to my limited time with a passport. I had the Priv, and I agree with you.. At the beginning, I trusted John Chen and found him the ''Savior''. But not, I think he is pulling BlackBerry's hardware to the demise. BlackBerry would never success in mid-range field. Htc, Sony, Lg and many other phone's manufacturers struggles a lot in this arena and lost millions of dollars every quarter on a losing business. Today, lots of Chinese companies are offering high-end phones on very affordable prices. Furthermore, the BlackBerry brand has been tarnished a lot in the last few years, so the company doesn't have that strong brand recognition to sell many phones like before. BlackBerry needed to focus on releasing the Priv for $499 to entice lots of new Android users besides the loyal BB fans to try its new high-end phone. John Chen is simply blundering in his strategy indeed! Not blundering. He's a software guy. He realizes that's where BlackBerry's strength is, and he's focused on it. Does that bode well for BlackBerry hardware? Time will tell, but so far, no. Chen has been completely transparent about his plans and how he intends to drive growth for BlackBerry. He doesn't want to abandon hardware, but he will if his efforts in hardware don't pan out. Quite frankly, BlackBerry really would be better off without hardware. Is that unfortunate for the BlackBerry faithful and user base? (myself included) Absolutely. But it is what it is. I'd rather BlackBerry still be around, even if it's as a software and services company, than not be around at all. But I feel your pain. I really do. Having similar specs to Moto X Pure ($350 now in the US), the PRIV needs to be the current BlackBerry'd mid-range tier. Chen should cut the PRIV price and sell it in a bigger volume instead of releasing another mid-range phone. That's actually something that he may consider doing when the next two handsets are released. I agree. At first I thought Chen was doing an ok job, but now it's becoming questionable whether blackberry can survive or not. It was pretty idiotic to release the Priv at a premium when it was their first Android device. He should have known the Priv wasn't going to survive in such a crowded and competitive market. Plus it's competing against some fierce competition and the only price drop they could do is $50? I'm not going to be like some people and make excuses for Chen or for anyone who makes questionable decisions. No, you only make excuses for Apple and questionable software releases year after year. So they are doing a couple more Android handsets...interesting. I still wanna see the sales split between the Priv and BB phones that ran BB OS. Would be interesting to know just how well or poorly the Priv did. Eager to see what these next two BlackBerry handsets will be all about. Hopefully, they will help rejuvenate their hardware division. Cue the trolls, haters, and whiners (you know who you are) that spend way too much time complaining about something they've never used or owned. I think a large part of Blackberry's failures of the past few years is mostly attributed to company policy changes. Employers used to require their employees to conduct business only on blackberry phones, but those policies have changed as security on other OSes have improved. Also companies used to provide employees their phones, but in order to cut costs have decided to allow the employees to choose handsets. Naturally, they'll choose ones that best suit them, and BB has never been a particularly strong consumer choice. They were the best choice for a little while, then the iPhones and Androids came out. Blackberry still has a place, but it is looking increasingly like that place is not in the hardware sector, because their fanbase is too small to sustain that sector. A very well thought out answer. I agree with you 100%. BlackBerry's have always been geared more towards business, and less towards the consumer. +1. Agree with all this. I remember when BB was where the iPhone and Android is now. Owning a BB back in the day was considered a status symbol IIRC. Companies need to pay attention to what happened to Palm, BB and MS. And one reason why Google better not get lazy and start resting or they will be next. I see Google as being a much more innovative company than Palm, BB, or MS. MS is consistently late to the game and they sell stuff that seems kind of homebrew. I think because Google listens to the youth and has a younger worker population. BB and MS seem to have some old dorks. Google is innovative now because they brought Matias Duarte (the father of webOS) over to overhaul Android. It's no coincidence how Android improved from Gingerbread to ICS. Duarte's fingerprints are all over Android now. Yup. WebOS was called arguably the best mobile OS when it was out according to some...and looking back on it....thats not a crazy claim. I think it's amazing that every article has to end with the same old story of how years ago Blackberry was this, that and the other but they fail the to do this, that and the third. And now they're dead, so they need to just die. That is crazy. And instead of rooting for them to produce more and better competition in the market, people are just trying to force them to die. We all know the mobile hardware arena is tough, but they are fighting! I think we should be encouraging Blackberry to keep fighting. And to show that just because trends change, you don't have to rollover and die. You can reinvent yourself. Winners keep fighting even when things get rough. Well said. Reinvent yourself. I think for BB its gonna be software, security tho. $600 is the maximum I would pay for a PRIV. If it was $500 I would probably already have one. I think they should build a more modern version of the Z30 running Android. But I have to say that my Passport running BB10 is still a favorite except the unusual screen ratio which is not good for video. Mid range phones huh, at least the SD650 and 652 are pretty powerful mid range chips so Blackberry should still sell a fair amount of handset, if these are the chips being used anyway. Had Blackberry and Nokia not been too stubborn, where would Samsung, Apple and Huawei be at? That's a great plan. At $400 they will sell like hot cakes. They should make em mid range. Hopefully they can pull it off. I just hope there is at least one last great BB10 phone made. ...give it up John, quit while you still have cred.